Is Trump Destroying the Bull Market in Stocks? President Trump has taken actions in recent days that continues to chip away at the reasons to be bullish on stocks. Well some stocks, perhaps, as the semiconductor names remain hot. Hang tough with your eight screens, stock traders. This week is far from over, and President Trump seems determined to remind everyone of that. Here are several things that caught TheStreet's attention during Tuesday ugly session. What started as a promising session today ended with a thud as investors digested Trump's ouster of Rex Tillerson as Secretary of State and the decision to block Broadcom's (AVGO - Get Report) deal for Qualcomm (QCOM - Get Report) . 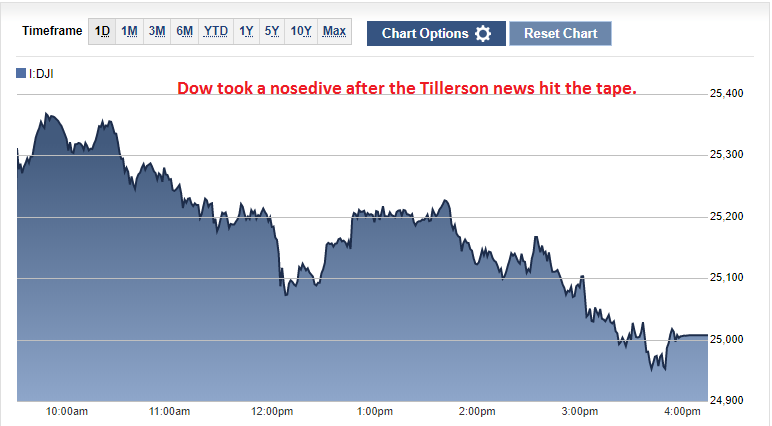 The Dow Jones Industrial Average traded about 1.45% off its highs of the session, finishing at 25,007.03. The benchmark index is now off roughly 6% from its late January closing high. Will investors begin to price more political risk into their thinking on companies? Perhaps, suggests one top expert at JPMorgan TheStreet talked with Tuesday. Even still, with the outlook for corporate earnings strong it will be difficult for investors to become too bearish on stocks, TheStreet's senior editor John Pickering thinks. So much for Action Alerts Plus holding Broadcom not being able to buy Qualcomm denting the remarkable run in semiconductor stocks. The iShares PHLX Semiconductor ETF (SOXX - Get Report) reached a new 52-week high early in the session Tuesday, to trade hands for as much as $198.84 after the market open. That's the highest the ETF has gotten since March 2000, reports TheStreet's Kinsey Grant. As you can see below, the ETF's top-10 holdings are a whose who of momentum tech names. 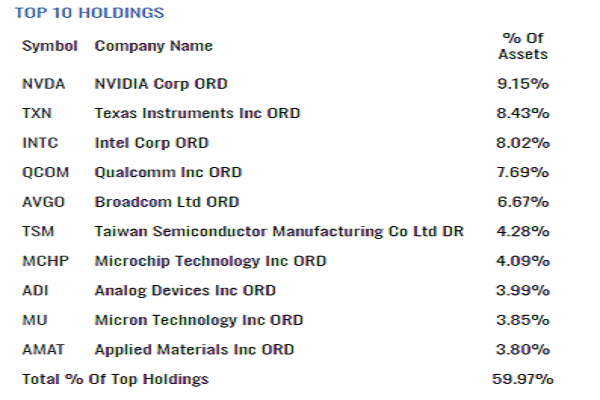 Top-performing semiconductor names continue to be Action Alerts Plus holding Nvidia (NVDA - Get Report) , Micron (MU - Get Report) and Intel (INTC - Get Report) . The surprise rally in General Electric's (GE - Get Report) stock last week now looks overdone. Shares of the struggling industrial giant tanked 4.5% today after a vicious sounding note out of JPMorgan. General Electric's earnings per share this year will come in "a step lower" than management's guidance of $1.00 to $1.07 a share, says the investment bank. The question now on everyone's mind: will GE's stock drop below $10? 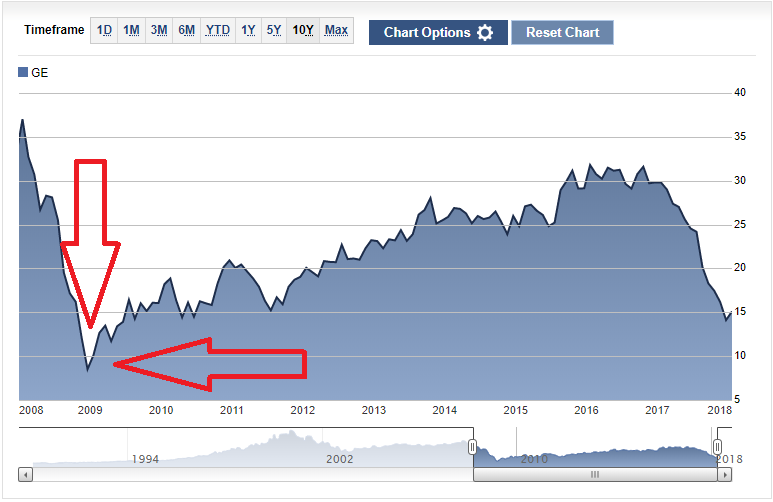 And if it does, will that spur the type of selling that drives the stock down to the Great Recession low around $7.00? Reading this and think there is no way GE's stock hits $7.00? Fire me a tweet @BrianSozzi and be sure to copy in @TheStreet.